We’re not in Heaven. We’re on Earth. You may have noticed, around here, the good life ain’t cheap. After the Fall, all the angels were a mess. Desperate for housing, any vessel would do. And they had no long game. I, on the other hand, took some care. I listened. A woman was praying for her dying husband, so we made a trade. His life for her vessel. She was grateful. I realized humans are so desperate for life they’d do almost anything, pay almost anything. So... ka-ching. I was a so-so angel but it turns out I am an excellent businesswoman. Sister Jo is an angel who was formerly known as Anael in Heaven, where she worked as Joshua's right-hand angel. She spurned Joshua's offer of more responsibilities after visiting Earth and seeing the pain and suffering of humans and questioning why God does nothing. As a result, she was demoted to a low-level functionary, counting souls as they enter Heaven. When the Fall happened, Anael, rather than look for just any vessel to take, listened to the prayers of humans and found a woman praying for her dying husband. Anael struck a deal with this human -- in exchange for saving her husband, Anael would get her as a vessel. Realizing the potential of desperate humans, Anael became a faith healer known as "Sister Jo" who traveled the country healing people for payment. After learning of Sister Jo from a homeless man, Lucifer arrives to a hall where he witnesses Jo lay hands on an old lady with a walker who then stands up straight and throws her walker away, and a man with burn scars on his face which are instantly healed. As Jo is closing up shop, Lucifer approaches her and reveals he knows she is the angel Anael. Jo in turn reveals she knows that he is Lucifer. She explains to Lucifer who her vessel was and how she found it after the Fall. Lucifer attempts to siphon her grace, but Jo is able to convinces him to only take small sips from her, and allow her to recharge, preventing the need to seek out other angels. She admits it is a preferable arrangement for herself as well, as it would keep Lucifer from killing her. After taking Jo's grace, Lucifer reveals how he had killed a cherub two nights ago, prompting Jo to ask if anyone knew he was coming to see her. Realizing they may be sought after, Jo and Lucifer take refuge in a motel where Lucifer continues consuming Jo's grace. Falling onto the bed together, Jo and Lucifer begin talking about their new experiences feeling "human", with Jo telling him she can almost envy humans for their capabilities to do anything, whereas as an angel she pushed a button and was of no consequence in Heaven. The next morning Jo is ambushed by Sam, Dean, and Castiel. She feigns being held prisoner by Lucifer, telling the trio he is weak, and agrees to take them to him. In the motel room, she tells Lucifer that they forced her to tell them how weak he is. As Dean prepares to restrain Lucifer, Jo attacks Sam, allowing Lucifer to get Cas and then Dean. As he begins to slowly kill the three, he is interrupted by Arthur Ketch who throws a demon bomb, forcing Lucifer to teleport himself and Jo away. Unsure what to do next, Jo takes Lucifer to meet with Dumah at the Playground, where Lucifer convinces the angels to make him the ruler in exchange for creating more angels and giving them their wings back. In Heaven, Jo stands beside Lucifer as he takes his place upon Heaven's Throne and the angels bow before him. Jo enters Heaven's Throne Room to find Lucifer sitting on the floor playing solitaire. When Lucifer asks where she has been and says that she should be more appreciative and stay by his side, Jo asks Lucifer why he isn't doing anything to lead the angels or inspire mankind. She tells him they came to Heaven to help the angels and make Heaven better. When Dumah enters with news regarding not being able to locate Jack, Lucifer gripes to Jo about the lack of respect and how God would be unquestioned in His orders to the angels. Jo simply tells Lucifer that God created and he inherited, and that if he wants to be treated like God, he should try acting like Him, before leaving the room. After his attempts at being God end in disaster, Lucifer complains to Jo about the weakness of the angels and humanity and how he plans on refocusing to find his son, Jack, so that together they can recreate the world in his image. Jo admonishes Lucifer; frustrated that he lied about being able to make more angels, she tells him it's not the angels or humans or God that are killing him, it's that he's afraid that his son will have nothing but contempt for him. She tells him he can't replace his father or create, so he might as well be back in the Cage. Lucifer reaches out from his seat and grabs Jo by the throat. His eyes blaze red in anger as he squeezes harder, staring at Jo, who is struggling for breath. Then he lets go and Jo backs away towards the door, leaving Lucifer alone, telling him he no longer has her either as she leaves. After a service spent healing the sick, Jo is walking down a dark alley counting her money when she is confronted by Michael. He asks her what she wants, and Jo gives him a materialistic answer, which Michael sees right through. He goes on to tell Jo that she just wants love, a family, and to belong. Finding her human-like desires disappointing, he tells her that if the other angels are as sad and fallen as she is, they may not be worth saving. Later, Jo places a call to Sam, telling him they have a problem. It's revealed that Jo told Sam about seeing Michael in Duluth, Minnesota. Bobby questions whether or not they should trust Jo as he believes that angels aren't the most reliable source of info, but Sam confirms her story when he finds a local news page about a pile of corpses who, according to the article, appear to have died as a result of angel smitings. Anael, also known as Haniel, is an archangel from Jewish lore. The name probably derives from Hebrew word for joy - hana'ah. Danneel Ackles is the wife of Jensen Ackles. 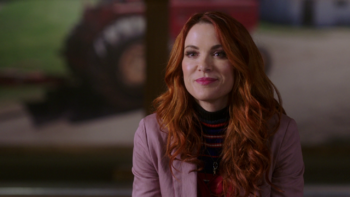 Julie McNiven suggested that Anael was the real angelic name of Anna Milton from Seasons 4-5. This page was last edited on 13 April 2019, at 12:39.